The owners of a capsized sand barge near Tanjung Punggai in Kota Tinggi have been ordered by the Malaysian Maritime Enforcement Agency (MMEA) to begin vessel’s salvage operations. First Admiral Adon Shahalan, who is the MMEA’s southern region commander, instructed the Ocean Line 208 owners to start salvaging works on their vessel in order to clear the waterways. The Admiral said that the salvaging works should start soon after the end of MMEA search and rescue (SAR) operations, carried out along with all the other related agencies last week. According to the local maritime officials, the overturned barge, which was previously located in the waterways, is now dangerous for other passing vessels in the area. 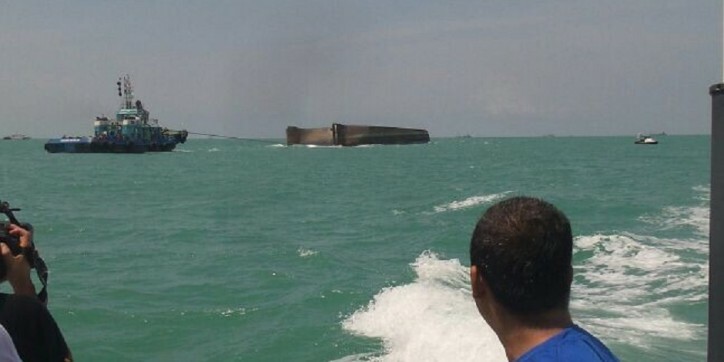 The overturned barge is currently located approximately 1.2 nautical miles from Tanjung Punggai. On May 21 it was towed closer to the shoreline for the SAR operations. MMEA Admiral Adon said the agency would continue to monitor the salvaging efforts for potential body recoveries of the drowned seamen. “Until then, there is no further operation to recover the bodies of the seamen from the overturned sand barge,” he said. The joint search and rescue operations tasked with the recovery of bodies from the sunken barge, were called off on May 26. The bodies of four Chinese nationals and one Malaysian have been recovered up to the moment. After the accident there was only one survivor, saved by a passing ship the same day. Nine seamen are presumed drowned and their bodies are yet to be accounted for.